Greta and Janet Podleski were slaving over their first cookbook, Looneyspoons, in their tiny office in Janet�s Ottawa basement, they wrote their goal � �1,000,000 copies sold� � on a blackboard. Fast-forward 10 years. 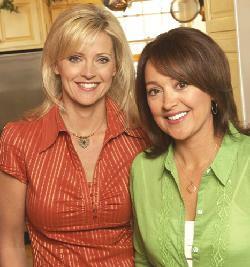 That book, at the time meant to be a one-hit wonder, has become the first of three � followed by Crazy Plates and Eat, Shrink and Be Merry � with a combined sales total of more than 1.8 million, plus a line of frozen dinners, another of kitchen gadgets and a television program, now in its second season on the Food Network. Looneyspoons alone spent 85 weeks on the national bestseller list and Crazy Plates was a finalist for the prestigious James Beard Foundation Cookbook Awards. �Who�d a thunk?� the sisters ask. In fact, one aspect that sets the Podleski�s books apart from other cookbooks is the �fun factor.� The recipe titles are puns and parodies of well-known expressions, movies, television shows, songs and such � �The Thigh Who Loved Me,� �Charlie�s Angel Food Cake,� �Dilly Beloved,� �Celine Dijon Chicken,� �The Gift of Crab� � and the books are peppered with cute quotes, jokes, cartoons, and fun food trivia. They succeeded beyond everyone�s expectations, including their own and Janet says it�s not just the puns and parodies but also the fact that Greta develops recipes with healthy ingredients that really do taste good. That�s the whole premise of their new TV show, Eat, Shrink and Be Merry spawned by their third book of the same name. Each episode features a popular high-calorie, less than nutritious comfort food � like chicken wings, burgers, pizza, ribs or even chocolate cheesecake � which challenges the sisters to create what they call a �waist-and-heart-friendlier� version that tastes just as good � or better. Once they have the healthy version, they take both �out into the street� � or the restaurant, fairground or farmer�s market � for a random taste test. �It�s kind of like Extreme Makeover Recipes Edition,� Greta chuckles. The success of the show � atypically picked up for the second season after just four episodes of the first � no doubt speaks to the success of their creations. What viewers and readers may not realize, say the sisters, is the time and effort that goes into creating tasty healthy food. It�s also not too difficult to make low-fat food but the problem is it will often taste like cardboard. �The key is to make something that is healthy and also tastes good. That�s what takes a lot of work,� she says. And, it�s more work today than it was when they started on Looneyspoons a decade ago. The entire healthy eating landscape has changed. To keep up, Janet went back to school and earned a degree in natural nutrition and is now a Registered Nutritionist, adding still more credibility to their offerings. When all is said and done, do these sisters, who spend their days telling people how to adopt a healthier diet and lifestyle practise what they preach? And it�s not just the food but lifestyle as well that they pay attention to. They exercise and make sure to get a good night�s sleep and take vitamin and mineral supplements, particularly important, Janet notes, when they�re on the road, putting in long days and finding it more difficult to find the good food choices they take for granted at home. They also maintain that the past 10 years of delving into healthy food and lifestyles has had a positive impact on their own health. In one of their favourite shows from Season One of their TV show, Greta and Janet created a healthy version of honey-garlic chicken wings and blue cheese dip. Whisk together all marinade ingredients in a medium bowl. Set aside. Cut each chicken thigh in half. Place chicken pieces in a large, heavy-duty, resealable plastic bag. Add 1/2 the marinade to bag (reserve remaining marinade). Turn bag several times to coat chicken with marinade. Marinate in refrigerator for at least 2 hours or up to 24 hours. Preheat oven to 400 F. Line a rimmed baking sheet with foil and fold or roll the chicken pieces into uniform oblong �wings.� Place wings on baking sheet close together (touching), as this will help them hold their shape. Bake for about 10 minutes, until partially cooked and still pink in the middle. Meanwhile, preheat gas grill to medium-high heat. Brush grill rack lightly with oil or spray with cooking spray. Using tongs, transfer par-baked wings to grill and cook for about 2 to 3 minutes per side, basting often with reserved marinade. The more you baste, the better they taste! They should have some nice grill marks on them. Serve hot wings with cold blue cheese dip. Whirl together all dip ingredients in the bowl of a mini food processor until almost smooth. The dip shouldn�t be perfectly smooth like sour cream; it should have some texture, but no lumps. You can mash the blue cheese and mix the dip by hand, but it will be chunky. Cover and refrigerate until ready to serve. Keeps in the fridge for about two days. Per Burger (patty only � the label on the package of buns will give nutritional information per roll): 229 calories; 11.2 grams total fat; 2.6 grams saturated fat; 8 grams carbohydrates; 1.2 grams fibre; 105 mg cholesterol; 485 mg sodium. To make sauce, combine peanut sauce, sesame oil, soy sauce, lemon zest and gingerroot in a small bowl. Mix well and set aside. In a large bowl, combine ground turkey, bread crumbs, green onions, cilantro, egg, salt, pepper, and 3 tbsp of the sauce (use the rest of the sauce to baste the burgers). Mix gently using your hands. Form mixture into 6 patties, about 1/2-inch thick. Cover and refrigerate until ready to grill. Preheat grill to high setting. Spray grill rack with cooking spray or brush lightly with oil. Grill burgers for about 5 minutes per side, or until cooked through and no longer pink in the centre. Brush burgers with reserved sauce during last 2 minutes of cooking time. 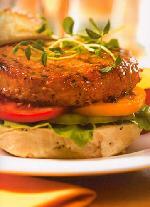 Serve burgers on lightly toasted buns with lettuce and sliced tomatoes or any of your favourite burger toppings. A classical dessert jazzed up with a symphony of flavours and textures. Per Serving: 256 calories; 6.9 grams total fat; 3.7 grams saturated fat; 3 grams protein; 48 grams carbohydrates; 4.4 grams fibre; 16 mg cholesterol; 12 mg sodium. To make topping, combine oats, flour, brown sugar and cinnamon in a medium bowl. Add melted butter and juice. Using a fork, stir until mixture resembles coarse crumbs. 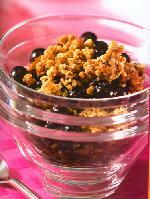 Sprinkle crumb mixture evenly over coated blueberries. Bake for 30 minutes, until blueberries are bubbling around edge of pan and crumb topping is golden brown. Cool for 10 minutes before serving (it�s hot!) Serve with a dollop of low-fat vanilla yogurt or light whipped topping, if desired. It�s also tasty with a small scoop of vanilla frozen yogurt.